STORY: After a successful sponsorhip of high-performance motors in my 12-pound Hell on Wheels, I joined ThinGap as an Applications Engineer, where I designed motors, fabrication equipment, and more. 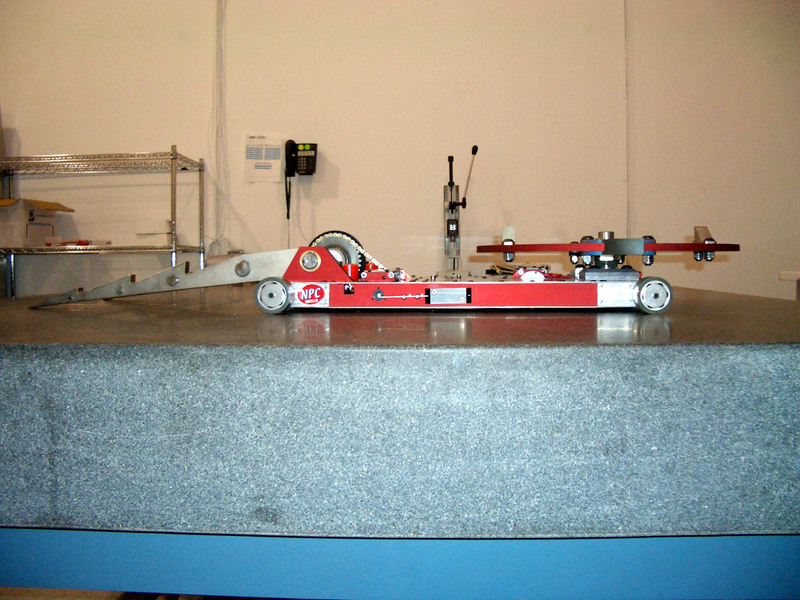 I wanted to showcase ThinGap's small-but-powerful motors in a 120-pound robot. Around the same time, NPC Robotics, who was the powerhouse in adapting their extensive wheelchair experience into larger motors/gearboxes/wheels for the bigger bots, was looking to develop some products for the smaller bots. Around a sturdy NPC-designed gearbox & a hardened version of ThinGap's smallest brush motor was born a compact motor/gearbox/wheel product, only 1.5 inches tall. For a few years, I'd been dreaming up a robot that would have 2 major weapons instead of just 1. 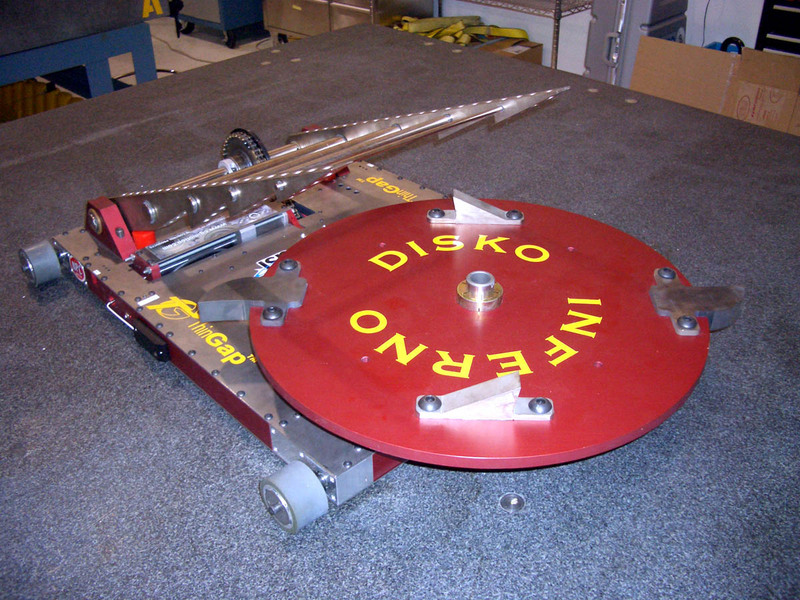 With the volume & weight savings of this compact drivetrain, I was able to realize my concept of a robot with not only a large spinning disk but also a powerful lifter--Disko Inferno was born. Its weapon combination allowed for self-righting; bringing the disk down to the floor level when fighting low bots; & flipping other bots onto the spinner's top teeth, garbage disposer-style. 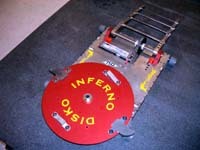 I entered Disko Inferno in RoboGames 2005, where Disko Inferno performed admirably. 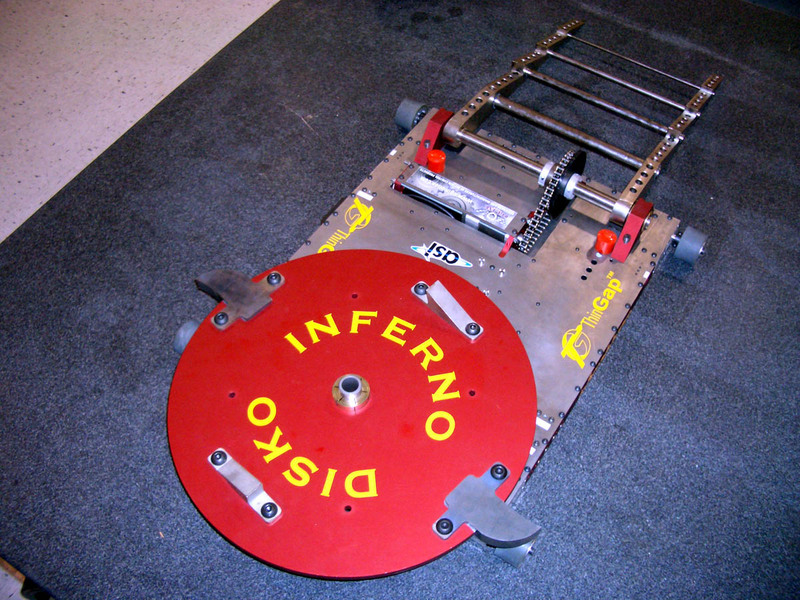 SPECS: Disko Inferno featured 4 small ThinGap brush motors & NPC Gearboxes & Whyachi wheels for drive. The lifter & spinner weapons were each driven by a large ThinGap motor that I had designed for a Navy Seals extreme power drill. 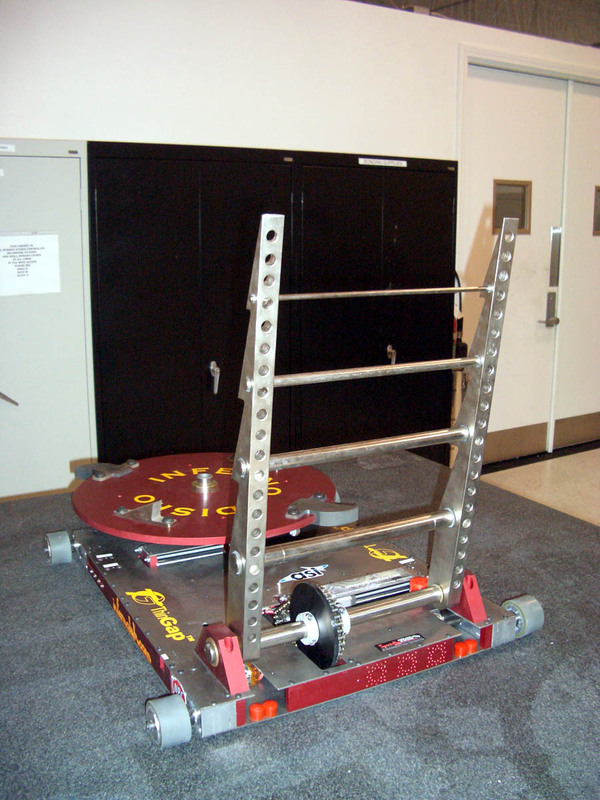 The spinner weighed 25 pounds (very heavy for a 120-pound robot!) & featured 4 hardened tool steel teeth. TECH DETAILS : Drivetrain: 4x ThinGap TG2300-42 high-torque motor + NPC 3200 Gearbox + Whyachi W238-150-44H aluminum wheel with urethane tread. Lifter weapon: ThinGap TG3300-63 high-torque motor + CGI 100:1 planetary gearhead + 6:1 high-strength #35 go-kart chain/sprocket reduction + 4130 steel lifter ladder. Spinner weapon: ThinGap TG3300-63 high-torque motor + 2.6:1 3L Fenner Power Twist linked belt/pulley reduction + Fenner Trantorque Keyless Bushing + 2 giant tapered roller bearings + 1.25" hardened 4140 steel tube shaft + aluminum 6061-T6 disk + 4 S7 hardened tool steel teeth. 5x IFI Victor 883 for drive & lifter weapon, 1x IFI Victor 883 SC for spinner weapon. 6x 12V 3600mAH NiCad Battlepacks. SPONSORS: Funding & motors supplied by ThinGap. Gearboxes & wheels supplied by NPC. Most machining by H.M. Co. All fasteners & other hardware provided by Specialty Tool & Bolt. Lifter weapon gearhead & customization by CGI. 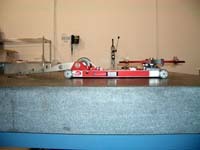 Final machining & assembly provided by ASI.